Super Smash Bros. Brawl is the third iteration of the Super Smash Bros. series. 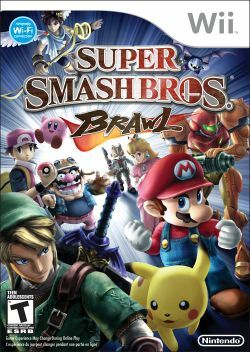 Although originally suggested to be a launch title for the Wii, Super Smash Bros. Brawl was delayed several times and eventually was released March 9, 2008 for North America and then June 27, 2008 for Europe and Australia. It is among the few Nintendo games to integrate online play on the Wii via the Nintendo Wi-Fi Connection. Some pretty big newcomers have joined the Super Smash Bros. lineup, namely Solid Snake of the Metal Gear series and Sonic the Hedgehog from the Sonic the Hedgehog series. Additionally, Meta Knight from the Kirby series, Lucas from Mother, Pit from Kid Icarus, Wario from Warioware, Ike from Fire Emblem: Path of Radiance, a Pokémon Trainer from the Pokémon series, Diddy Kong from the Donkey Kong series, and a modified version of Samus named Zero Suit Samus are also newcomers. Mario, Donkey Kong, Link, Samus, Yoshi, Kirby, Fox, Pikachu, Bowser, Peach, Zelda, and the Ice Climbers continue their appearances in Super Smash Bros. Brawl. The Super Smash Bros. Brawl website stopped its regular updates upon the American release of the game. This page was last edited on 8 January 2017, at 21:57. This page has been accessed 441,178 times.